Both groups and tags have many potential applications for sorting, segmenting, and searching through your supporters in Salsa. So, which one should you use? You should use both! 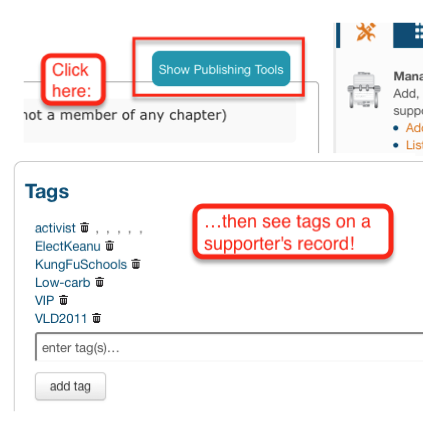 Tags and groups can be used together to help you keep track of your supporters in efficient, powerful ways. What’s the difference between groups and tags? 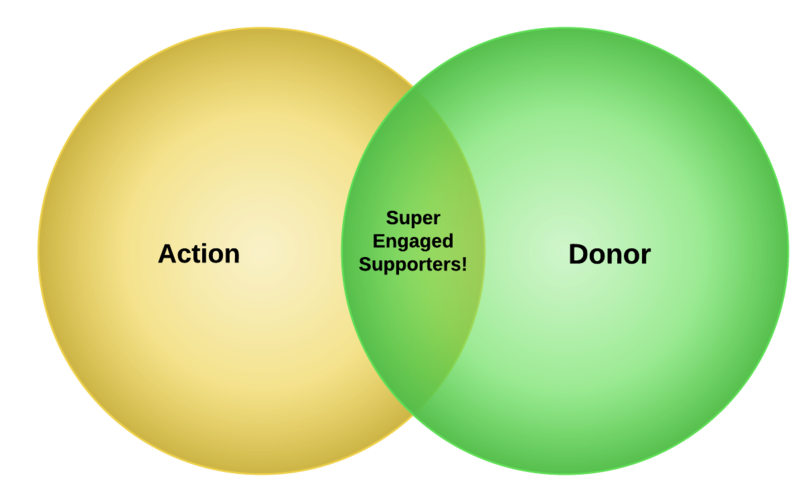 Groups are ways to group supporters into different subsets: donors, people in a particular state, people who signed on to a particular issue, newsletter subscribers, etc. Groups only work with supporters, that is, people in the Salsa database. Tags are also used to create subsets, but 1) they can be attached to nearly anything in Salsa, including individual supporters, signup sheets, donation forms, and events; and 2) they’re sticky: any supporter that touches something with a tag will be tagged accordingly. In other words, someone who signs up on a page tagged with "Blimp Owners' Rights" will get their supporter record tagged accordingly. But—it sounds like I could just use groups for that! Or events! Tags have a slightly quicker user interface and easier visibility, especially if you ever have to do manual data editing in individual supporter records. Adding the tag Conference Call: May2012 to an individual record is a really fast way to make a quick event, since tags autocomplete as you start typing and you can also add this tag to signup pages. You can also quickly see what tags a supporter has. Manually adding people to a group or event takes only slightly longer than adding tags, but if you're in a position where you have a lot of manual entry to do (say, VIPs calling in to register for a quick event at the last minute) you'll have an easier time of it using tags. You can always tag people manually, then later use a query to pull them into groups. As a cognitive and organizational task you’ll have an easier time thinking about two different sets of data segmentation when you go hunting for things: treating them as different data points makes it easier to paint the pictures you want when you run queries. You can also throw tags around as experimental data points to track actions, which is easier to query than making group counts. See our example below under the "So how does that help?" heading. Say you've got three issues you're working on, and you want to know how the groups break down among your supporters. Does everyone support all your issues? Do people like one and not another? Are tons of people subscribed to newsletters on an issue, but only responding to certain calls for action or support? Tags: 2 each on actions: Action-taker and Petition/ Letter (type of action); 2 each on big events: Event-participant and Rally/ Protest/ Service Day (type of event). Participants in these actions or events will get tagged accordingly. With these tags in place, after a certain amount of time and events have taken place, you can now run queries like: "Members of Blimp Ownership and Elect Keanu and tagged with Action-taker" (people who support both issues and have taken any kind of action) or "People in Minnesota and Members of Teach Kung Fu and Donors and not tagged with Event-participant" (people who support a certain issue and who donate, but didn't go to your 2011 Minneapolis March for Kung Fu). Once you've segmented these groups, you can do research (why are so few people supporting more than one of your issues?) 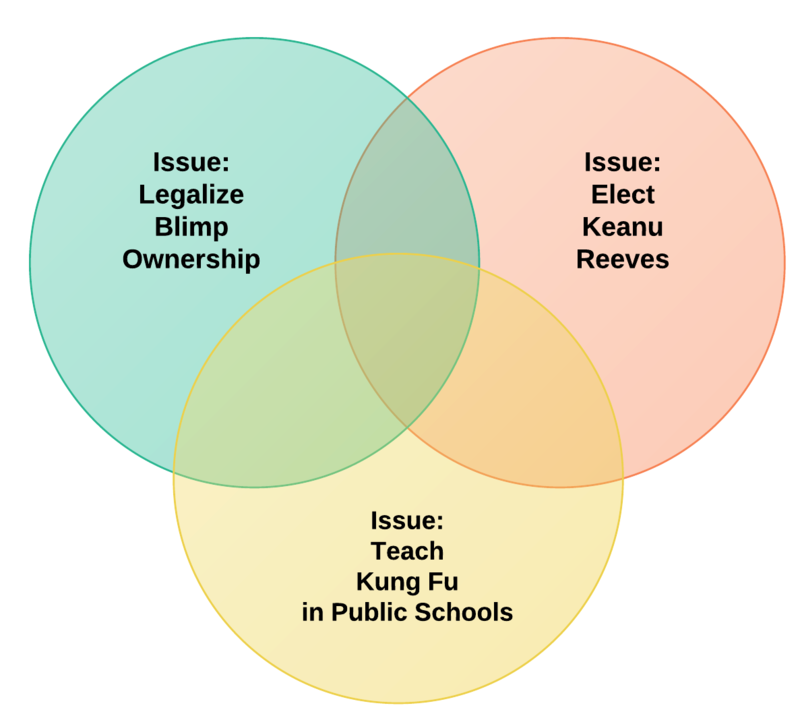 or plan special appeals (reach out to people who have taken action online but haven't donated or attended live events yet) or adjust your marketing (turns out nobody in Utah likes Keanu Reeves, so find a different message for the Beehive State). Additionally, you can very quickly segment supporters based on their activity. While Salsa allows you to build complex queries based on whether a person participated in any individual activity or opened a particular email blast*, sometimes you just want to know really quickly how many people in California have donated and taken action at some point––and depending on how precise you want to get with your tags, you can define " superactivists" however you want based on their past behavior, then find people matching that description. In the end, tags represent a shorthand way of doing similar segmentation tasks involving groups, Salsa packages, and queries. But that's the real beauty of tags, and perhaps the best reason to try them out: you can experiment with different ways of looking at and combining your supporters without changing your existing groups or workflows. Add a hundred tags to each supporter if you like, and see how the dots connect--you can always delete the tags, transition them to groups if you identify a new permanent segment you'd like to identify, or mix and match them to your heart's content. You may find that a simple tweak to a query or an appeal suddenly becomes more effective because it's reaching the right people, the people who want to do more for your cause and just need the right ask at the right time. * Note : Putting a tag on an email blast doesn't automatically tag supporters who open or click on it, precisely because different organizations may have different definitions for what "deserves" the tag (Opening the email? Clicking on it? Clicking on one very important link? Opening three emails in a row? etc). Tagging an email blast will just make it so that it comes up in searches for that tag. But you can always run a query to find supporters who opened or clicked on a particular email blast, then add a tag to those people. Akash has spent time in many different capacities at small non-profits, where he's been volunteering or working since college. He's seen things you wouldn't believe. He's even got 501(c)(3) tattooed on his bicep. (Not really.) He's used his unique blend of hi-tech savvy and low-tech problem solving to improve congressional advocacy, online fundraising, campaign communications, and volunteer organizing on issues ranging from environmental education to geriatric pharmacotherapy. He currently serves on the board of the Friends of the Cecil County (Maryland) Public Library and volunteers in his church's youth ministry. Thanks for the run down on tags vs groups. It is helpful to think about. You seem to imply that one can add a tag to all members of a group easily. Is that true? Would you have a link on directions to do that? In the supporter package, click on Query/Export. 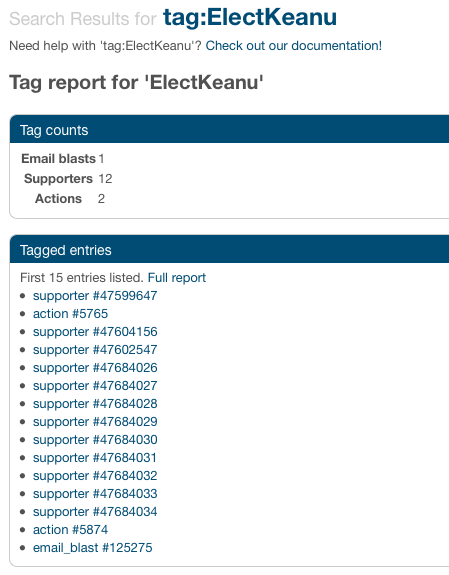 You can run a query to identify supporters that have a certain tag. Once you have the correct list of supporters, you can add them all to a specific group on the Take Action step of the query workflow. If I have applied a tag to an event, does that tag get added to every supporter who has been invited to, signed up for, or attended the event, OR only to those who attended? How long does it take for the tag to get applied? Tags are not applied when a supporter is put into Invited status. As a side note, event statuses are for record keeping purposes only. Putting a supporter into Invited status doesn't send them an email to invite them, it indicates that you've invited them offline and are managing their attendance personally. If you want a supporter sign up for the event by filling out the event form, DO NOT invite them via the attendees tab. Simply segment your list and email them a link to the event page. One thing I am unsure of after reading this is why I would ever need a group if I can use tags? Is there any functionality a group provides that a tag does not?